As casual observer you might think that the Ohau Lodge is a quiet ski lodge in one of the most remote parts of New Zealand and that it would only cater to a family ski holiday. While no-one would blame you for thinking this you would be horribly incorrect. I will say that it does cater perfectly to Mum and Dad, not only is staying there cheap but it is easy, very easy. The cheap cost of a room (we paid $270 for 3 people) includes breakfast and a 3 course meal for dinner. The lodge itself is nestled in the startling landscape of the South Island’s Mackenzie country, where the bar, dining room and spa pools look out over the breathtaking view of Lake Ohau. What does all of this have to do with an aching head you may ask? To which, the answer is the Glen Mary House bar. 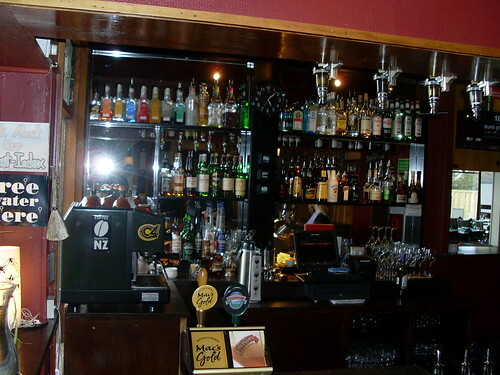 This place may well be the heart and soul of Ohau, it is a bar which you can only wish that every place you go to has. $4 basic spirits and cheap beers would normally be all I would have to say, but it doesn’t stop there. The deck is massive and get’s some great afternoon sun, the staff are extremely friendly and happy to have a chat and the chances that your fellow visitors are going to be like minded are very high. My mention of the spas is definitely relevant to the hangover that I woke up with, when we checked in we asked the receptionist about the whereabouts of them to which she replied, “Oh they are just over there, and there aren’t any rules. You can drink in them and they don’t have a closing time.” Taking full advantage of that, my companions and I polished off a couple of boxes of beer and pretty much put ourselves on the ropes for the rest of the evening. A couple of gin and tonics, dinner and a couple of glasses of wine and we were well and truly ready for bed. Dinner was close to the highlight of the stay, (except for the beef and gravy rolls on the skifield) we were served pumpkin and coconut soup, followed by roasted yams and pork belly with a blueberry pie for desert. I certainly didn’t walk away hungry and the preparation and quality of the food was top notch, especially when you compare it to other places within a 200km radius. While the dinner was sensational, the breakfast was somewhat of a let down, billed as a 2 course breakfast the cereal, fruit and coffee was good, not great (although how you have below average cereal beats me) and the hot part of the meal was small, served with no toast and tasted like it had been being warmed for a few hours. Don’t let me put you off with my lack of enthusiasm for the breakfast though, everything else about my stay was amazing and I’m really keen to go back. Hopefully in the summer when all I’m interested in doing is getting boozed and having a lazy time and not letting something like snowboarding get in the way.